The academic year is starting in a few days and the International Community Project is ready to start again. But before meetings and research, we thought it was time to give a graphic idea of our aims, so… We developed a logo! It is quite simple, but goes straight to the point: there are four hands, each one represents a geographic area of interest and some of the flags of the countries we focus on colour them, with the Union Jack as well. 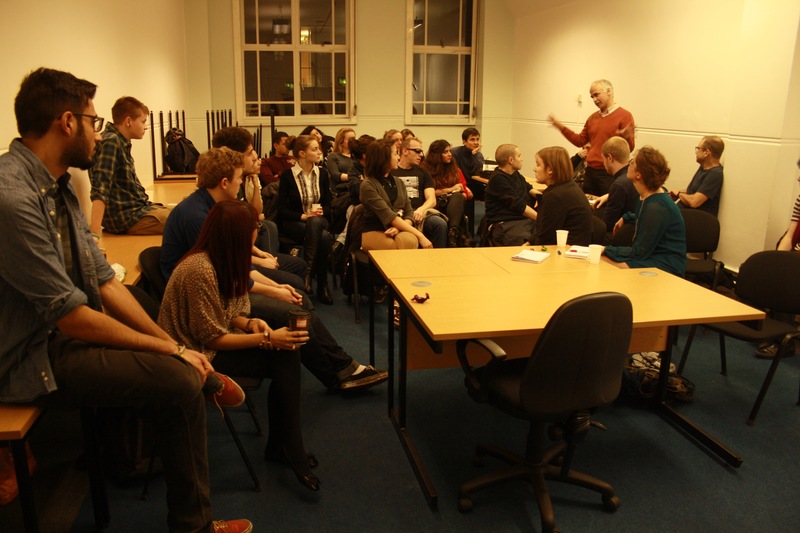 On 22nd of November the CSD: International Community Project hosted an introductory evening in order to welcome new members to the research project. During the course of the evening members of ICP, Ricardo Blaug and Farhang Morady presented the aims and aspirations behind the research. Dr. Morady talked about the history and the foundation of the project. The idea was born several years ago after a joint conference with Turkish academics and community leaders. 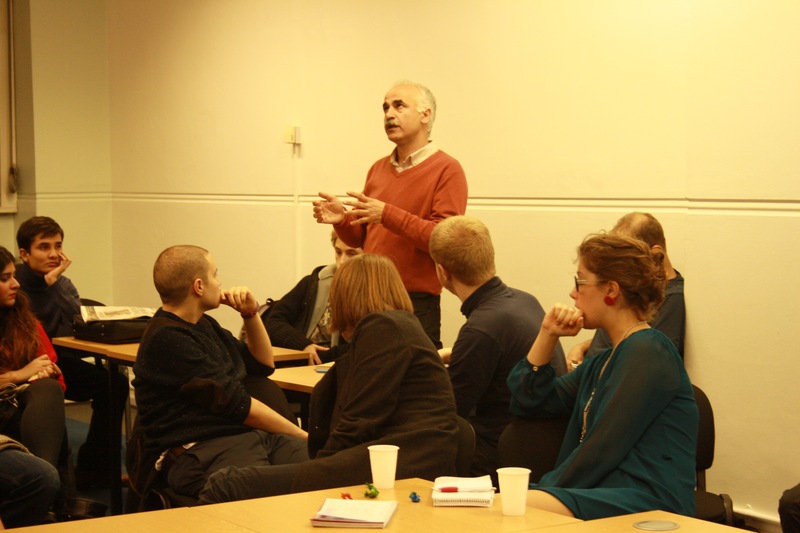 The concern of a disconnect between academia and the wider community was apparent leading Dr. Morady to the idea of research on Turkish communities in London. 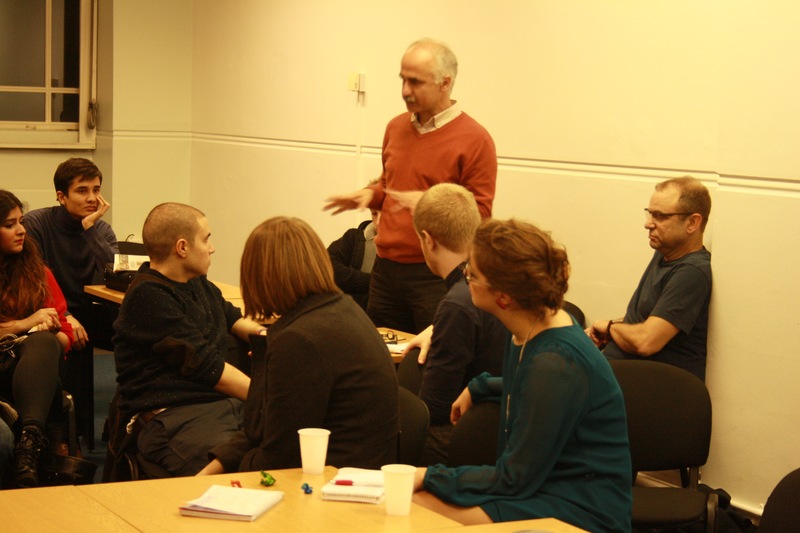 However, the diverse multicultural nature of London and with University of Westminster situated in the heart of it, an idea blossomed to include other communities into research. Dr. Blaug talked about the benefits of the project being the part of Centre of Study of Democracy. He also spoke to students of advantages in being part of undergraduate research including the impact on future job prospects and learning new skills. Following this, students detailed their progress so far such as field trips to communities in London, and the international trip to Turkey. Students elaborated on their plans for the near future such as visit to Bangladeshi community and research methods workshops. The presentation also highlighted the social and collective aspect of the project. The evening finished in high spirits as prospective members of ICP had a lively informal chat with presenters, Ricardo Blaug and Farhang Morady. This article is also featured in the QH. From the depths of economic crisis just a decade ago, Turkey has risen to become an emerging regional and global superpower which is reigniting influence and economic dominance at the crossroads between Europe and Asia. To achieve such a radical departure from the past, the state has undertaken wide-ranging reforms to strengthen the role of its free market economy through rapid industrialisation, financial sector reform and an extensive programme of privatisation. As a testament to the achievements of the governing party over this period, the Justice and Development Party (AKP) of Turkey was able to recover quickly following the 2008 global banking crisis, and with an 8.5% growth rate Turkey continues along the path of strong economic development .As with other emerging powers such as China ,Brazil, Russia, Turkey is being forced to face the challenge of social inequality, as high GDP growth does not necessarily translate into a rise in living standards for the wider population, with human development progress indicators below the regional average and a widening wealth- disparity gap. With her unique geopolitical position, active foreign policy and rich cultural heritage, this makes Turkey an interesting study of globalisation and its implications for students of Development Studies, International Relations and Politics. With the initiative of Dr. Farhang Morady, every year students of Department of Politics and International Relations have an opportunity to travel to Turkey in order to examine various phenomena of political and cultural development through observations and discussions amongst staff and students. This year’s field trip was enhanced by the development of the new student-led ‘International Community project’ which focuses on the integration of various immigrant communities in London. Students on the trip experienced the hustle and bustle of Turkish and Kurdish communities in their resident country in order to broaden their insight and give a grounding of possible challenges that these communities face in London. For the first part of our trip we headed to Istanbul, which although not the formal capital of the modern Turkish state, it remains the economic, cultural and historical heart of Turkey. A city of extraordinary historical significance, Byzantium of old, Constantinople, or presently, Istanbul, has been the centre of political power for the Eastern Roman Empire, Byzantine Empire and Ottoman Empire. A unique fusion of Western and Eastern cultures, Istanbul is a truly astounding blend of ancient and modern, resulting in a vibrancy that makes the city unlike any other in the world. From the area of our hotel, Kadıköy, the culturally Western quarter, we travelled across the Bosphorus to the Old City. Visiting the Sublime Porte and the Topkapi Palace students got a feel for the administrative heart of the sprawling Ottoman Empire. Whereas the wondrous Hagia Sophia, an architectural child of Christian and Islamic parent civilisations reminds onlookers of the varied and contrasting nature of Istanbul as a city that was once the heart of the classical Roman empire, a Christian, and Islamic Empire. The vast and splendid Blue Mosque (Sultan Ahmed Mosque), whose spires and minarets rise high above the surrounding metropolis, emphasises the influence of the latter, increasingly so with the continuing active use of a congregation of worshippers. After briefly browsing the Grand Bazaar, the spices and incense, the fragrances and odours which threaten to overwhelm the unwary tourist, and perusing the Roman Cisterns and the powerful Classical Archaelogy Museum, led by our trusty Westminster Third Year guide and resident of Istanbul we toured the Islamic quarter of the city, Fatih. The cultural differences were stark, yet the secular areas of Istanbul were still relatively close by. There was a noticeable absence of bars, the fashion styles of the high street shops had changed with head dresses and full body garments replacing the more bodily revealing Western styles as you would expect. However, the area remained as overtly affluent as any other areas we had visited contrary to the group’s assumptions. More importantly than the shallow analysis of our particular surroundings was the comparison with these same areas, Istanbul and later on our trip, Izmit, with the students before us in previous years and residents too, noting the increasing cultural Islamisation. This reversion to religious custom in a previously renowned secular state is one observable effect of the destruction of traditional ideological party politics within Turkey following the rise of Erdogan’s dominant AKP, with religious discourse filling in the political vacuum. 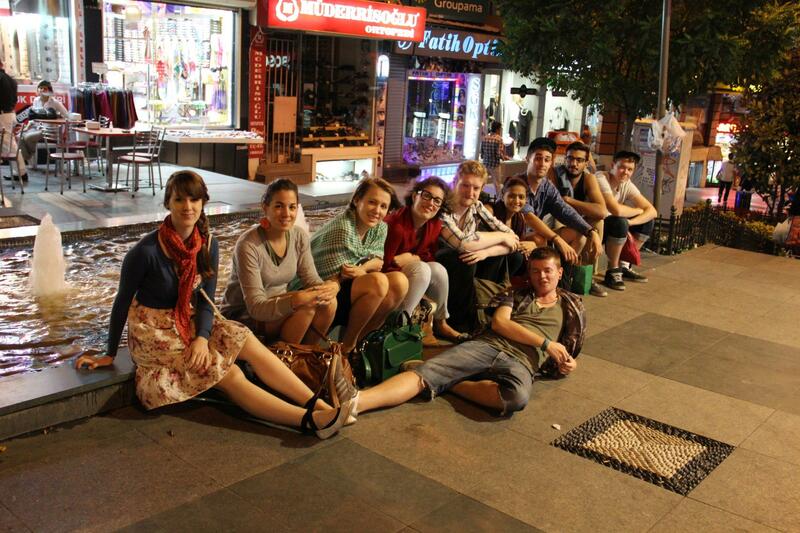 Although, we learnt, as with Kadıköy, not all areas had changed in this way. Kadıköy’s municipal council is composed of socialists, left-wing members and activists which have preserved the leisurely local drinking establishments and Western culture of the area. After leaving Istanbul, students headed east to Izmit, one of the main industrial centres of Turkey, which was devastated by earthquake in 1999. Izmit is also the home of Kocaeli University which was the host of ‘Flexibility: Fourth International Conference of Political Economy’. At the conference students had the chance not only to sit in on discussions over a wide range of subjects such as globalisation, economic development and global crises, but also to make new academic connections and to network with participants from the USA, Turkey, Italy and the Czech Republic. Also a special workshop was organised for the International Community Project which extended students’ knowledge of Turkish economic and social development. Also Dr. Farhang Morady presented the project with the idea of strengthening the relationship and engagement of students and academics of University of Westminster and Kocaeli University. Students also had the chance to enjoy Turkish food and live music at the party which was organised for conference participants. Izmit charmed students with its lively and warm atmosphere, local hospitality and the beauty of its location on the cusp of the Sea of Marmara. Five days of field trip in Turkey was a great start to the new academic year. Students would like to thank the Department of Politics and International Relations and specially Dr. Farhang Morady for organising this field trip. For more information on ‘CSD: International Community Project’ please contact us on csdcommunityproject@gmail.com. Written by James Moulding and Kateryna Onyiliogwu from Centre for the Study of Democracy: International Community Project. After visiting Somali community last week, this week we had a great afternoon in the Halkavi centre, mainly Kurdish / Turkish community. As well as welcoming us they informed us about the arrival of Turks and Kurds into the UKand their engagement in Londonand beyond. 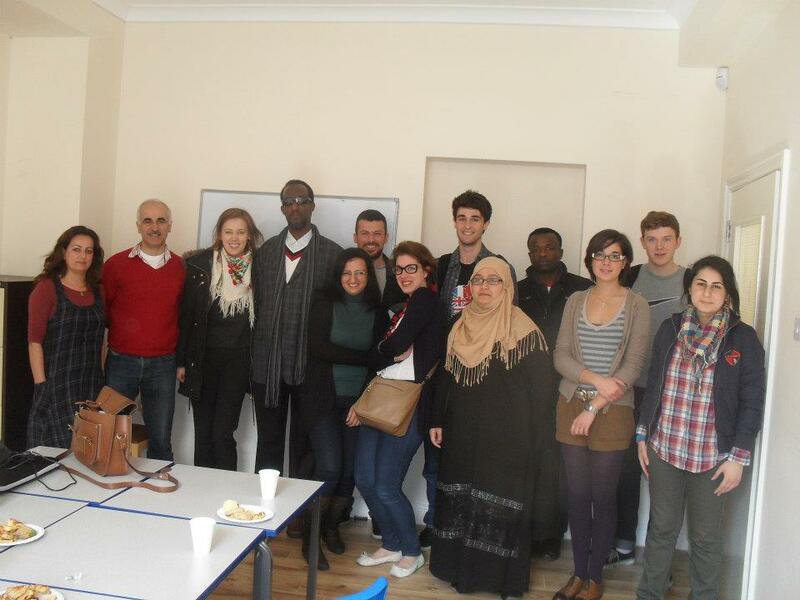 We learnt about economic, political and social issues related to the Kurdish and Turkish emigrants in London. The centre is not just for refugees or asylum seekers to seek support, it is also an education, cultural and social centre for all. It is a centre that provides support with housing, employment, immigration and nationality issues, interpreting and translating. We thoroughly enjoyed being there and learning about ‘borders in mind and borders in reality.’ We began to develop some comparative analysis of Somali and Kurdish community. The two visits have given us now some ideas from which we can start developing our research question/s. 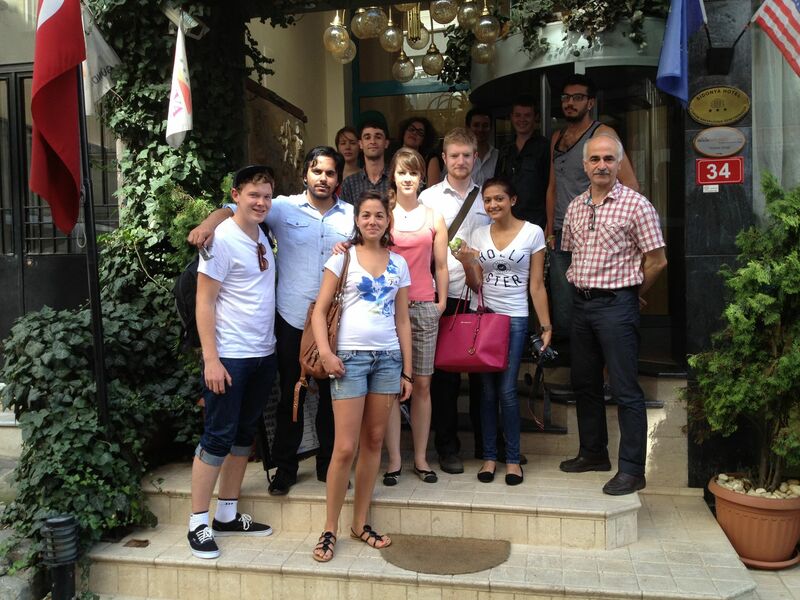 I must also say that the lunch in Kurdish / Turkish restaurant was fantastic, especially, celebrating Kateryna’s birthday! Well done to all, especially, Rusen! We were lucky enough to take our first community visit to the Baraka Youth association, to meet with Abdullahi Ali, the project coordinator. We received an incredibly warm welcome, above and beyond what many of us were expecting, and were made to feel comfortable straight away. – Language barriers, regarding both the provision of English teaching for adults, and the ability of younger members of the community to speak their native language. – Education within the community; many Somalis are unqualified whilst around 3% achieve qualifications at a higher level.- Despite being one of the oldest communities of African immigrants in the UK, Somali born immigrants have the lowest rates of employment. As with many of the immigrant communities in the UK, many Somalis retain strong links with their home country, both cultural and financial, and this has contributed to their strong national identity. Despite this, Abdullahi told us how many Somalis, especially those of younger generations, were beginning to forge dual nationalities. I think that all who attended this, the first of the community outreach meetings for the research project, were struck by the warmth and sincerity of Abdullahi and his willingness to engage with what we are trying to achieve. The meeting was both informative, and provocative, and Abdullahi was very open, sharing with us many personal stories and giving his own opinions on what is important to the Somali community in London. I think that we all hope that the further meetings with other community leaders will yield such promising results and engaging experiences! Hello fellow students and lecturers! 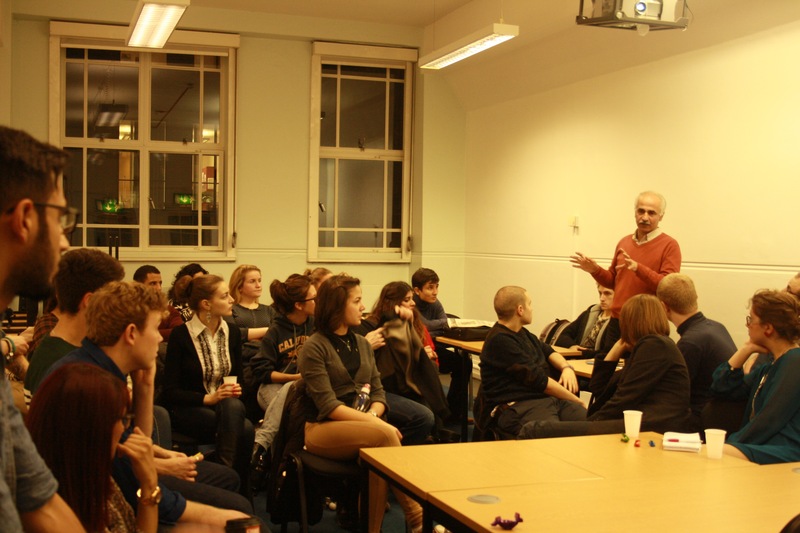 This is the platform for the CSD International Community Project by University of Westminster. In this blog there will be posted news, future events, community visits and research materials. The blog is in embryo stage at the moment, so if anyone has any ideas or suggestions which can help to improve it, you are all welcome to comment here, write us an email at csdcommunityproject@gmail.com or talk to us at the meeting. Please subscribe and you’ll get the newsletter of the Project.